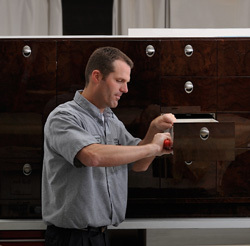 It takes very little time to make sure doors and drawers are properly adjusted and won’t puncture the cabinet veneer. Interior modifications are trending away from complete refurbishments and moving toward partial interior work. Most DOMs are keeping costs down by fixing only what they must to help their interiors look and feel less worn. It’s easier on the balance sheets, but leaves something to be desired in passenger comfort and peace of mind. With proper planning, a complete interior modification can be effectively phased over several years of regularly scheduled maintenance events. Doing so can extend the “like-new” quality of an interior through to the end of its functional lifespan. More importantly, regular interior maintenance can also help materials last longer, prevent damage, lower costs and increase aircraft availability. We call this approach “phased interior maintenance.” Here are four ways to get started. 1. Maintain functional items to prevent damage. Ongoing maintenance of big ticket items extends their lifespan and makes an interior investment last longer, says Matthew. Functional items can break or damage surrounding materials if they aren’t maintained. It takes very little time to make sure doors and drawers are properly adjusted and won’t puncture the cabinet veneer, says Nate. Otherwise it takes multiple hours to repair and refinish the veneer. 2. Schedule interior items with related maintenance events. Pairing inspections that require removal and reinstallation of interior items with maintenance for those same items can save weeks of downtime, says Matthew. Inspections that require the removal of seats and floorboards are a prime opportunity to replace carpet and recover seats without extending the service schedule. 3. Anticipate scheduling and budget considerations. Aircraft availability can be affected if last-minute additions cause scheduling conflicts, or if there isn’t enough lead time to order necessary materials. As a general rule, larger aircraft should have interior projects planned at least six to eight weeks in advance, says Matthew. Smaller aircraft can be done with less lead time, about four to six weeks. 4. Create an interior maintenance schedule. Estimating downtimes and determining what interior modification services can, or should, be scheduled with maintenance events can get complicated quickly. An interior maintenance plan helps operators perform annual evaluations, anticipate interior repairs, and budget more effectively, says Nate. If the plan is followed, it also helps soften the blow to the balance sheets by spreading interior costs over several years. Duncan Aviation works with operators to create custom interior maintenance schedules for Directors of Maintenance (DOMs) and their aircraft, free of cost or obligation. For more information, or to request a phased interior maintenance schedule, please visit www.DuncanAviation.aero/interior.